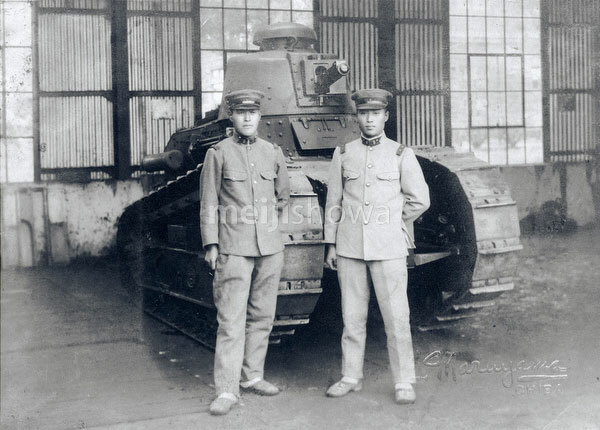 Two Japanese soldiers stand in front of a French Renault FT-17 light infantry tank, one the most revolutionary tank designs in history. It was the first tank with armament in a rotating turret. Its configuration of a turret on top, engine in the back and the driver in front is still used in most tanks today. First introduced in 1917, the Renault FT-17 served in the final months of WWI. It was later exported to many countries. Japan imported 13 FT-17’s in 1919 (Taisho 8), which were used in the Manchurian Incident (1931-1932) and for training. The French guns were replaced with Japanese armament. More than 3800 of these tanks were produced. Although many of these were still in service at the outbreak of World War II, by then they were completely obsolete. Photo by Maruyama in Chiba.